Photo: New Zealand team in Kenworth, England 1954. 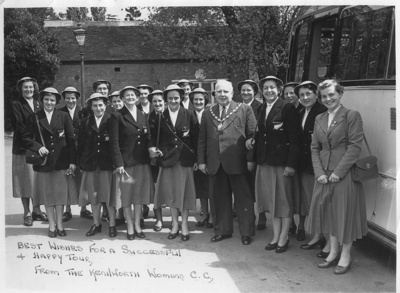 New Zealand team pose for a photograph in Kenilworth, England with Kenworth's mayor, 1954. Team are photographed outside in front of a brick building by the team bus. Team are wearing team blazers and hats.